Academics today have to publish to succeed. In Publish or Perish: Perceived Benefits versus Unintended Consequences, Imad A. Moosa assesses the disastrous consequences of this view for academics, both personally and academically. Review by James Hartley. This review originally appeared on LSE Review of Books and is published under a CC BY-NC-ND 2.0 UK license. Publish or Perish: Perceived Benefits Versus Unintended Consequences. Imad A. Moosa. Edward Elgar Publishing. 2018. If this book were half the price, it would reach more than double its audience. 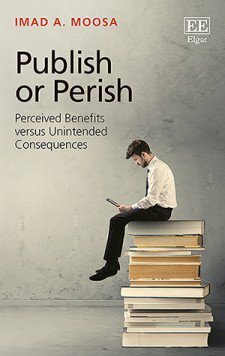 Authored by Imad A. Moosa, Professor of Finance at Royal Melbourne Institute of Technology (RMIT), Publish or Perish: Perceived Benefits versus Unintended Consequences is a diatribe against modern academic working and publishing practices. Across ten chapters, the book focuses on how academic lives, research and teaching have been, if not destroyed, then at least totally ruptured over the last 20 years or so by the culture of “publish or perish”. Regrettably, however, the last chapter, “The Way Forward”, offers no convincing solutions, arguing as it does that “the way forward is to go back to days gone by, prior to the destructive ideas associated with Reaganism-Thatcherism”. There are some wonderful statistics in this text (as well as some 90 less-than-wonderful acronyms). I particularly liked Figure 2.1, showing the average growth rates of published research in science and engineering in different countries from 1990-2013. Here, Egypt and Iran head the list (some 26 per cent per year) above China (18 per cent) and the UK (4 per cent). Figure 3.1 is similarly dramatic. This shows the rise in the number of multiple over single authorship papers in business journals (an increase which can no doubt be replicated in other science and social science disciplines). Presumably Moosa sees this as undesirable, but the evidence suggests that joint authorship leads to better papers (and more citations). A section on “predatory publishing” gives some telling examples of what some so-called “publishers” get up to, and includes a short account of the Beall affair (Jeffrey Beall maintained a now-withdrawn list of journals that authors should avoid because of their dubious practices); new authors would do well to read this section. A similar section, on what I call “predatory authors”, lucidly covers the issues of plagiarism, fraud and “salami slicing” (publishing different aspects of a single study in separate papers to increase their publication rate). 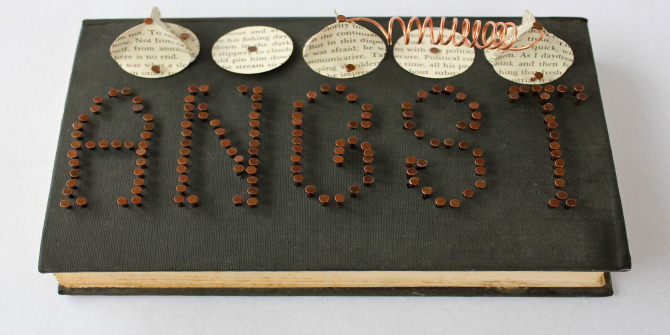 Image credit: Angst (Altered Book 2011) by robfos. This work is licensed under a CC BY 2.0 license. Chapter Seven covers the strengths and weaknesses of peer review, and here the author has a field day, citing studies of famous papers not reviewed or initially rejected by peer review, as well as fabricated papers accepted for publication without question. The chapter sub-headings point the way: “methodological and ideological bias”; “bias against new ideas”; “confirmation bias”; “obsession with finding faults”; “negligence, reckless and dishonest practices”; “referee incompetence”; and “delays in the peer-review process”. The final two-page section here offers “alternatives to peer review”, though this is woefully short. What are needed here are perhaps not alternatives to peer review, but rather ways of strengthening it. Thus I welcome the initiatives developed by the Committee on Publication Ethics (COPE). Chapter Nine focuses on attempts to measure research quality, such as the Australian Research Quality Framework (RQF); the Excellence in Research in Australia (ERA); the New Zealand Performance Based Research Fund (PBRF); the British Research Assessment Exercise (RAE); and the UK Research Excellence Framework (REF): all different schemes basically devised for administering and allocating scarce resources. In a nutshell, Moosa sees these schemes as pernicious (and expensive) wastes of time and resources, causing immense stress for younger members of staff. He concludes that “universities will be asked to do more with nothing, which means that some universities will inevitably perish”. To which I will add, “and not just universities”. Publish or Perish is not a cheerful book, but it is one that all academics should read and consider. James Hartley is emeritus professor psychology at the University of Keele. He is the author of Academic Writing and Publishing: A Practical Handbook (Routledge, 2008).